Easy Social Share Buttons for WordPress adds to your site unique WordPress social share buttons, awesome looking social followers counter, easy to use subscribe to mail list forms and social live chat functionality. All that in the recognized as the most powerful and feature packed social sharing plugin by WordPress experts. Revolutionary WordPress social sharing plugin trusted by 500,000+ sites. This extensive social sharing plugin for WordPress offers maximum flexibility and social media exposure by allowing you to share on more than 50 of the major social networks, including a wide range of mobile messengers. Not only that, but Easy Social Share Buttons for WordPress also boasts the best and most complete package of 55+ beautiful templates for social sharing and personal template builder, and the most comprehensive set of 30+ automatic design positions, 30+ attention grabbing and eye catching animations. This social sharing plugin for WordPress is unique in covering every possible location for displaying your social share buttons. Easy Social Share Buttons for WordPress is real trendsetter in social media for WordPress for an upcoming 4 years, trusted by all type of WordPress sites including leading technology brands. With Easy Social Share Buttons for WordPress you get everything you need to boost your social shares, increase your social followers or grow your mailing list in just a single WordPress plugin. Will your WordPress site be next to grow social shares, followers or subscribers? Also includes Love This, More button, Share button, Comments and Print/E-mail buttons. Our advanced social sharing plugin for WordPress is integrated with Social Metric, so that you can track and monitor your social media activity across Our advanced social sharing plugin for WordPress is integrated with Social Metric, so that you can track and monitor your social media activity across social networks you are using on your site. As the best social sharing plugin out there, Easy Social Share Buttons allows you to build and connect to your profile on all of the most popular social networks supported by followers counter. Please note that share counters are not officially available for the following networks, because of missing APIs: Weibo, Tumblr, Digg, Flattr, WhatsApp, Meneame, Blogger, Amazon, Yahoo Mail, Gmail, AOL, Newsvine, HackerNews, Evernote, Mail.ru, MySpace, Viadeo, Line, Flipboard, SMS, Viber, Telegram, Skype, Facebook Messenger, LiveJournal, Kakao Story. 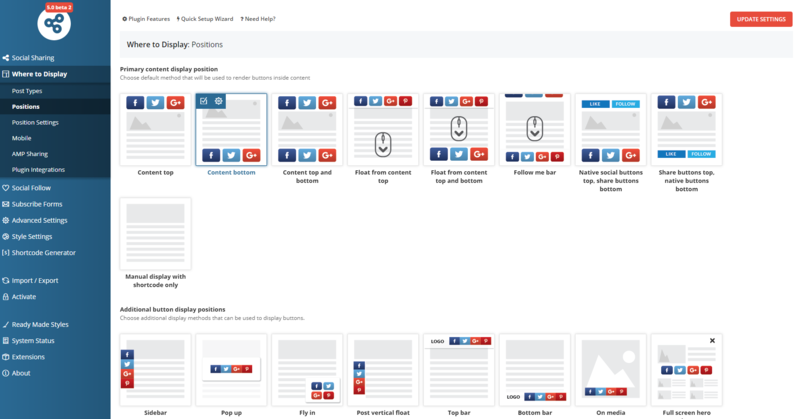 The Easy Social Share Buttons plugin provides an option to track them internally. Once you have activated the social share plugin you can get started right away! 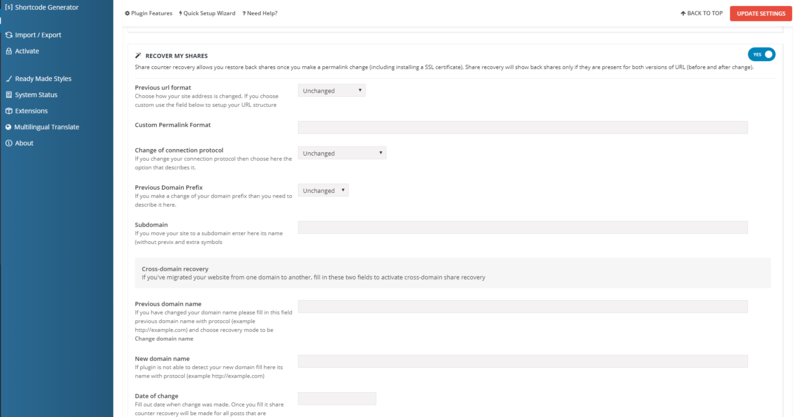 With the built-in quick setup wizard, simply follow the steps to customize your settings. 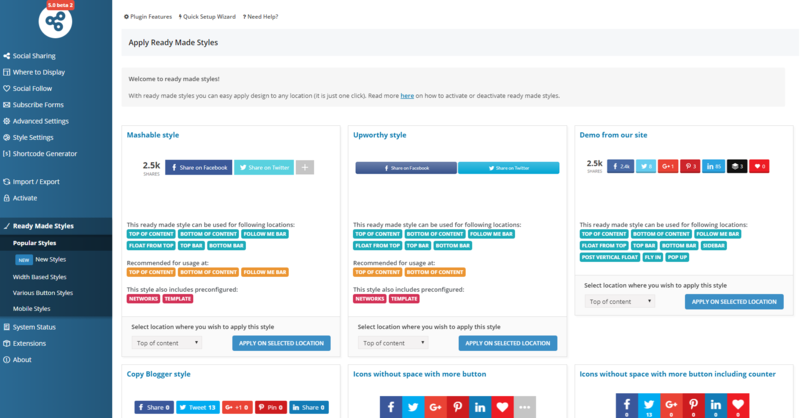 Not sure which button-styles will suit your site? Try one of our ready-made presents library with 40+ styles, which you can install with a single click. We have included a collection of popular styles, and some handpicked suggestions from our team! Like the style of Mashable? Try it out! Prefer CopyBlogger? Give it a go! Like the look of Upworthy? See if it suits you. What to see more? Visit our presents demo page where we include 35+ of most popular configurations loved by users. 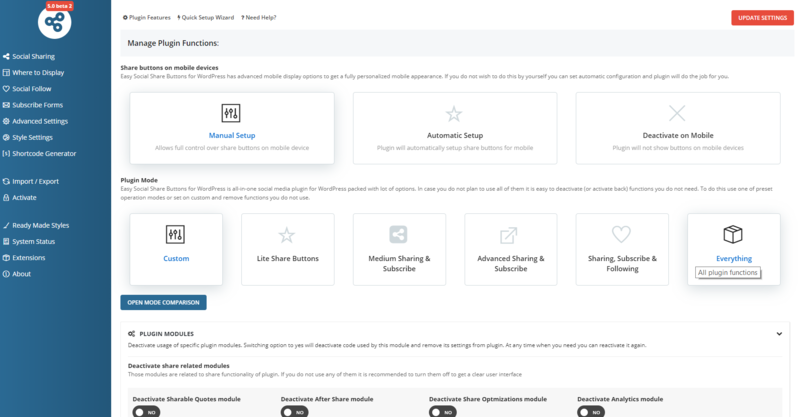 Our leading social sharing plugin for WordPress gives you complete control over every feature and configuration, with no coding knowledge required. 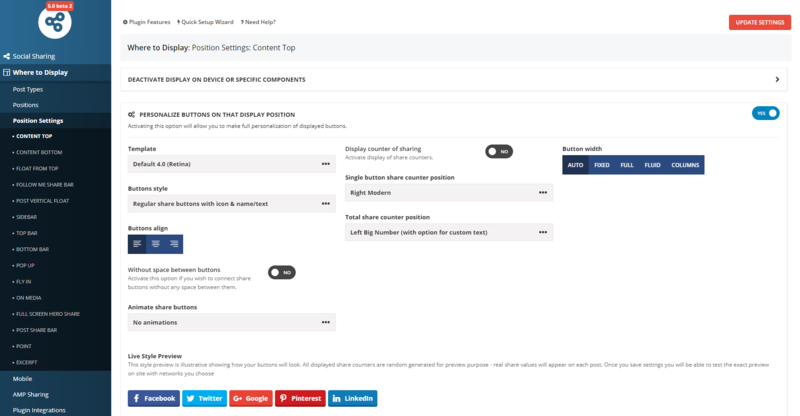 With complete control we really mean complete – you can personalize settings over each location, post type, module integration or just for a single post with visual and easy options (no coding knowledge required!). All that is made via intuitive admin settings control panel supporting different settings level for every type of user or need. 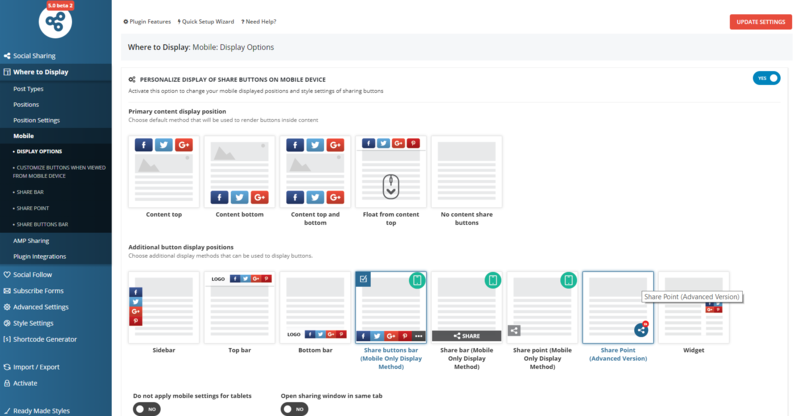 Compare different Easy Social Share Buttons for WordPress options level and functions. Easy Social Share Buttons for WordPress is the best social sharing plugin – whatever your needs – because it is fully integrated across all of the popular social networks, and packed with every feature you could possibly want! A great way to allow readers show their appreciation (love) for your content. 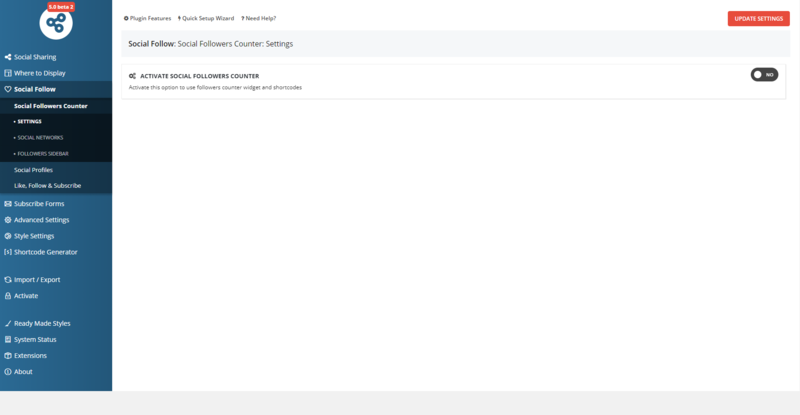 This button uses internal counter for each post or page. You can use it as standalone button or in combination with other share buttons. You can also display list of most loved posts using widget, shortcode or Visual Composer element anywhere on your site. The best social sharing plugin for WordPress offers you unique real working subscribe to mailing list button. You can use it with 3 different modes: link to subscribe page, custom subscribe from with html code or shortcode from your favorite plugin, beautiful service integrated form using Easy Optin module with support for MailChimp, GetResponse, MyMail, MailPoet, MailerLite, Active Campaign, CampaignMonitor and Jetpack Subscriptions. The best is that you can use the subscribe button on any device and with any of Easy Social Share Buttons display positions. Build in integrated forms has 7 beautiful designs that you can easy customize in terms of colors, images or texts with build in visual options. That is truly unique feature of social sharing plugin that you will help you build your subscribers list. Do you like how it looks? You can also use it anywhere on your site even without share buttons with the help of shortcode or widget. Read more for this below in description. After share actions are an important way of engaging active users with your site and content, increasing your social following, populating your mailing list, or running your own code. This is the most effective way to do this – users that you will reach using this method are most socially engaged on your site and you can get extremely high conversion rate. Easy Social Share Buttons for WordPress is all about growing your social media profile, and making your content social share-friendly as part of your ongoing social media strategy. If you make the most of this feature-rich social sharing plugin you will see an increase in shares, Retweets, re-Pins, Likes, +1s…and an all-important boost in the click-through rate to your site. Unlike many other social sharing plugins for WordPress, this advanced plugin includes optional meta tags, to improve your Google search ranking and social media sharing. 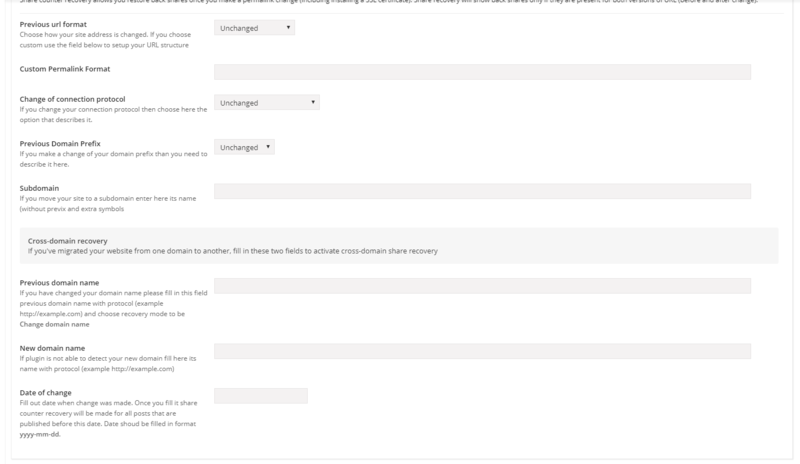 The plugin automatically generates Open Graph meta tags, Twitter Card meta tags and Google meta tags, and you can customize these in your page/post options. Easy Social Share Buttons for WordPress also allows you to customize a pre-populated Tweet that will appear when a visitor clicks the Twitter button. Not only that, but it also automatically incorporates any SEO optimizations you have made via the popular Yoast SEO plugin, without you having to lift a finger! 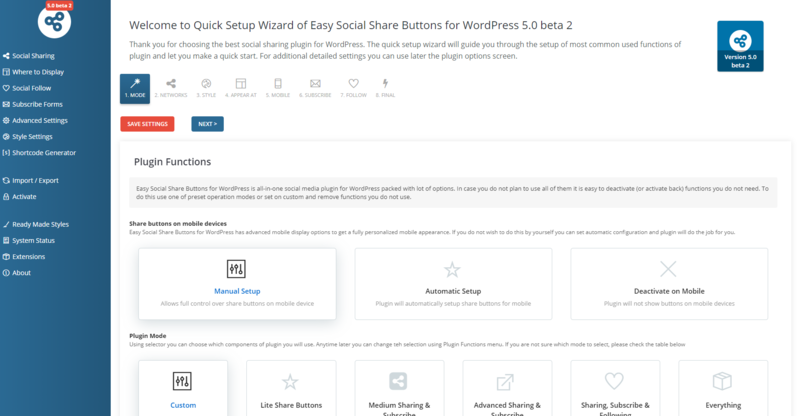 Easy Social Share Buttons for WordPress includes 27+ built-in, automated display button methods and 10 powerful shortcodes, so you can create a tailored social sharing experience for your visitors. These were just fairly few examples of combinations. The limitation is only your imagination. For convenience and flexibility, Easy Social Share Buttons for WordPress can also be used with shortcode call. This makes it easier than ever to include the buttons you need, wherever you want them on your theme or page. You can combine this with other display methods for an even better, and more unique, user experience. For example, you could display a pop-up after a few seconds of page load, combined with default share buttons display. With Easy Social Share Buttons for WordPress you can create a unique experience for every user, based on their interactions on your page. This will help you to capture or keep their attention at the most crucial moment. After Commenting – After a visitor leaves a comment on a post or page, you can interact with this highly engaged user through a social pop-up or fly-in. After WooCommerce Purchase - Display a sharing pop-up or fly-in to your customers after they checkout so they can share your online storefront with friends and family. Exit intent – Display a friendly share reminder to users when they try to exit a page. See how it looks. The first social sharing plugin with seamless integrated display method API. Now it is really easy for developers to create custom display methods integrated into plugin via external add-on or directly in theme code. Easy Social Share Buttons for WordPress includes a wide selection of templates, button and counter styles, and animations so that you can fully customize the sharing experience for your users. 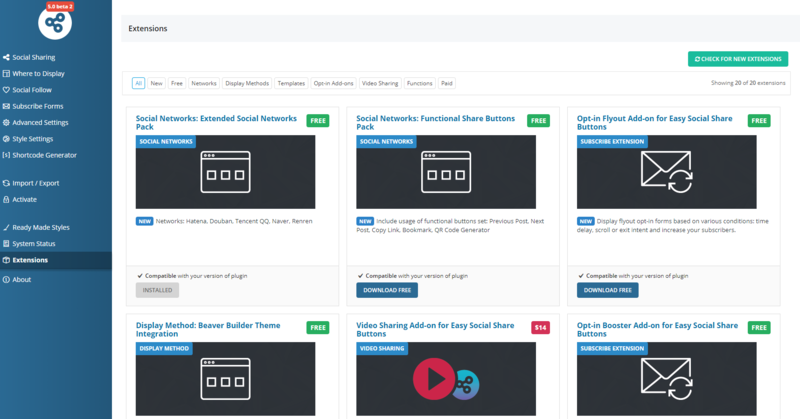 The most complete set of templates that you can ever find in social sharing plugin. Now you can easy find the best that fits for your site – be truly unique. Ready to take a look? Unique template API for developers and designers to build own templates that will be integrated into plugin at all places. 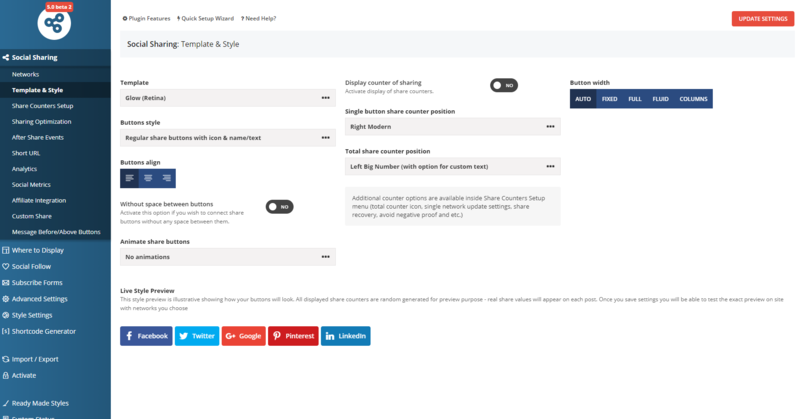 Extend your theme and include unique template for all your customers and make your share buttons even more attractive. The best is it will work with all styles, width concepts, animations and counters. Easy Social Share Buttons for WordPress is fully compatible with all latest changes that Facebook API made and you will see your share counter on site. As a backup we also give you the option to display them with access token. Real time share counters that are always up to date. Background updated (cached) counters, which update after a set period of time. Take your shares with you! If you change your URL structure or move to a new domain, Easy Social Share Buttons for WordPress offers you a wide range of options to recover your shares. The ability to control when share counts are displayed means that you can avoid negative social proof and leverage positive social proof when the opportunity presents itself. Easy Social Share Buttons for WordPress allows you to choose when you want the total or button counter to appear (after a specified shared value is reached), to maximize the positive impact of your share counter. This complete bundle of social share buttons for WordPress includes 12 native social buttons that will help you improve your SEO and popularity over social networks: Facebook Like, Facebook Follow, Google +1, Google Follow, VK.com Like, Twitter Follow and Tweet, YouTube Subscribe, Pinterest Follow and Pin, ManagedWP.org, LinkedIn Company Follow There is also an added option to tailor your buttons and hide them behind a skin. We understand and respect the importance of social privacy. Easy Social Share Buttons for WordPress comes with the option to activate social privacy for native buttons in just one click. We were the first plugin that allows to protect users privacy when you wish to use native buttons. Monitoring the social activity of your users is an essential part of any social media strategy, and is crucial to growing your profile across social networks. As the best social sharing plugin and the most comprehensive package on the market, Easy Social Share Buttons for WordPress gives you all you need to monitor, analyze and optimize your social media interactions. Fully integrated with Google Analytics, this social sharing plugin makes analytics simple. 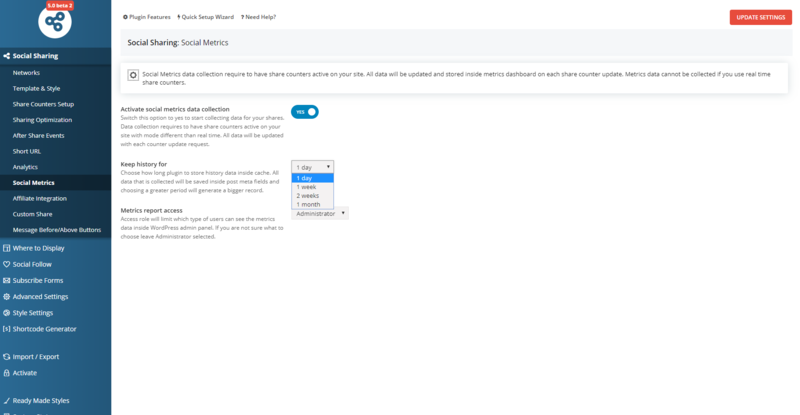 Easily view the clicked social buttons in your Events data, and even create custom campaign tracking parameters to measure the success of a particular approach. Wondering which content attracts the most visitors, and gets the most shares? 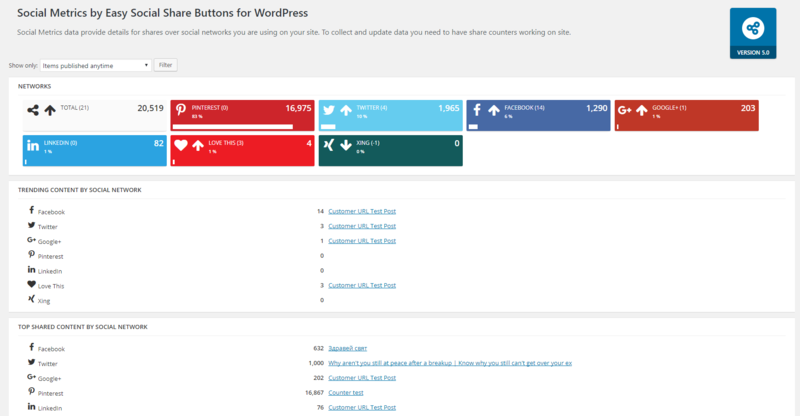 Easy Social Share Buttons for WordPress includes a click log and analytics function that is easy to run and interpret. Group the information by social network, by post/page, by button position or by device type, and generate detailed reports. And all that data is provided into user friendly visual way. 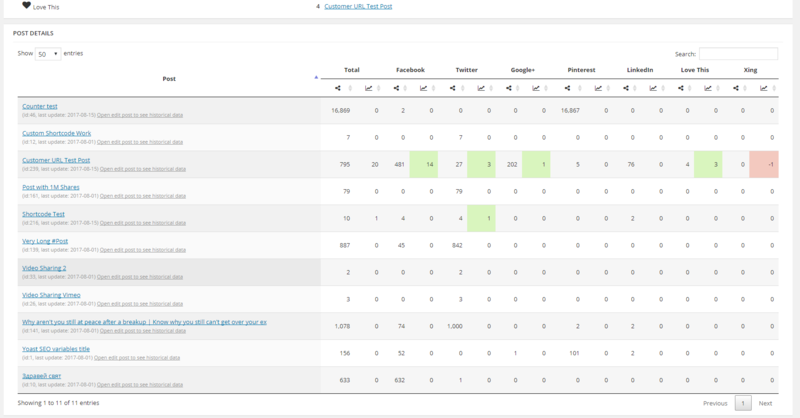 Social Metrics tracks Likes, Pins, +1s…and more!...right from your WordPress dashboard. It’s never been easier to identify effective social media activity and to use these metrics to inform your overall strategy. With our ultimate social sharing plugin for WordPress, you won’t need any additional modules. Social Metrics even presents you with on post/page information about your most active social networks, most popular social content, and top commented content. You can optimize your social media engagement by making it as easy as possible for your users to view your social network profiles and become a follower. That’s why your complete social sharing plugin includes a social profiles module, allowing you to add links to all of your profiles using automated display functions, widgets or shortcodes. 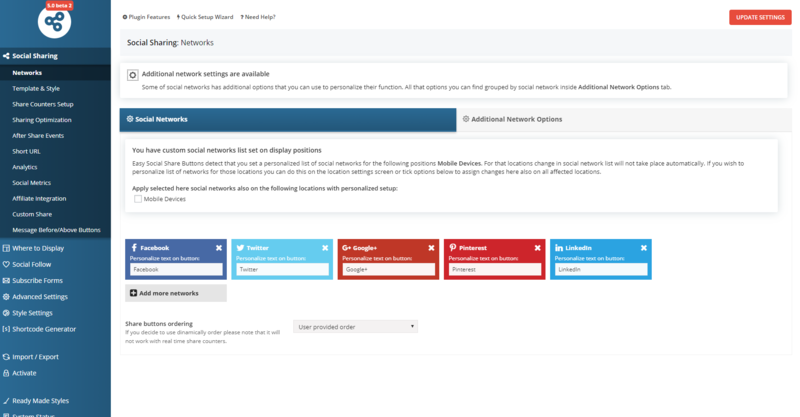 The social profiles module supports 30 of the most popular networks and offers a variety of button styles, colors and sizes. Easy Social Share Buttons for WordPress has build in Easy Opt-in module which is truly replacement of subscribe forms plugin. With Easy Opt-in you can display beautiful subscribe forms anywhere on your site or after specific event. The best is all that works fast and smooth. 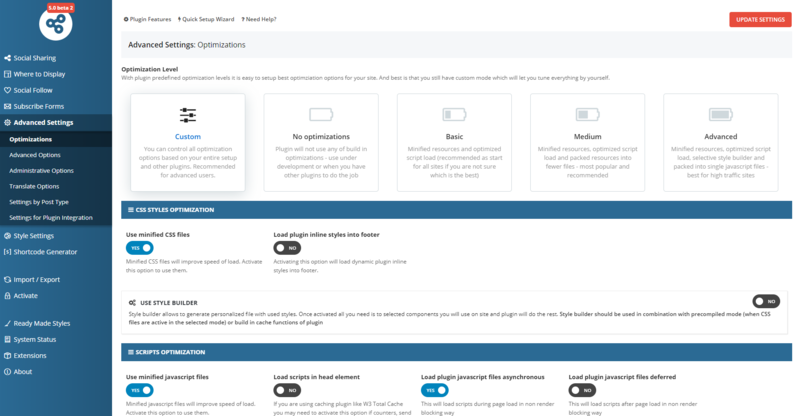 Easy Optin has support for MailChimp, GetResponse, myMail, MailPoet, MailerLight, CampaignMonitor, ActiveCampaign, SendInBlue and Jetpack Subscriptions. If you use additional service do not worry for this – we have friendly developer API that will help you to integrate your own code for service. 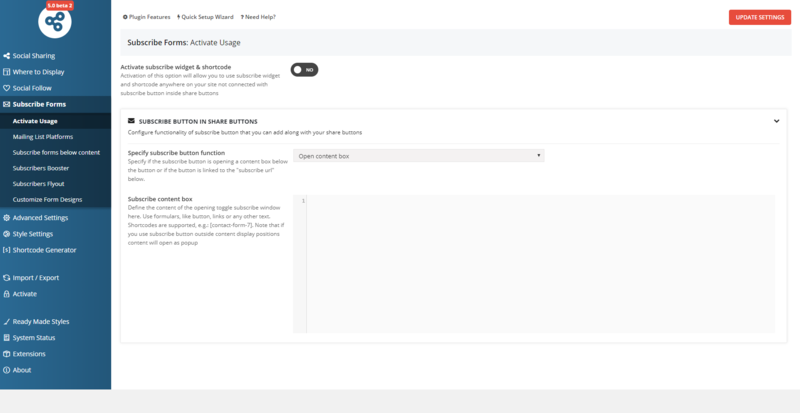 All that 8 beautiful forms that you can add anywhere you wish using shortcode, widget, Visual Composer element, automatically below post content or trigger at specific event like scroll, timer or exit intent – it has everything that you need to grow your subscribers with style. Take a look how your subscribe forms can look. Try Optin Flyout that will display a nice fly-out subscribe forms based on events like scroll and timer. The best is that you can also easy add two step opt-in forms using build in shortcode for this. Easy Social Share Buttons for WordPress is unparalleled in terms of integration and functionality, so it’s the only social sharing plugin you will ever need! Fully integrated with Visual Composer, Easy Social Share Buttons offers 10 content elements that can be dragged and dropped into your chosen position on each post/page: Social share buttons, pop-up social share buttons, fly-in social share buttons, native Like, Follow & Subscribe buttons, total social shares, social profiles, followers counter, total followers count, popular posts, mail list subscribe forms. We know how important social sharing is for your online business, so we have made sure that Easy Social Share Buttons has extended integration with the most popular eCommerce plugins for WordPress: WooCommerce, JigoShow, WP e-Commerce, iThemes Exchange. Easy Social Share Buttons for WordPress allows you to display buttons in both bbPress and BuddyPress. For bbPress, you can choose to display buttons inside forums and posts – see how it looks. The supported locations for BuddyPress are the User Activity and Group pages. We understand that you need to be able to track your affiliates, so your social sharing plugin includes integration with the most popular affiliate plugins: myCred, AffiliateWP and Affiliates. 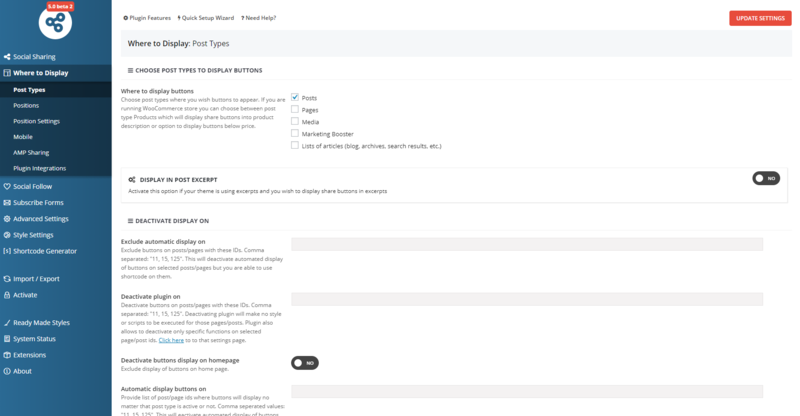 Your best social sharing plugin for WordPress works with all post types that you have – build in or custom. You can also automatically display buttons into excerpts of your list of posts pages (blog home, category or taxonomy listings, search results). All these optimizations make Easy Social Share Buttons for WordPress suitable for any site no matter it is small blog or high traffic site. The best social sharing plugin for a multilangual site. Easy Social Share Buttons for WordPress support translation of in plugin specific texts on different languages using friendly screen in settings with support for WPML & Polylang. Truly unique feature that will help your share buttons speak on any language of your multilangual site. Mobile compatible We know how important is mobile experience for you and this is why Easy Social Share Buttons for WordPress is mobile compatible. Easy Social Share Buttons for WordPress also comes with dedicated mobile devices options for better mobile experience. And we also support Google AMP via official plugin for WordPress. 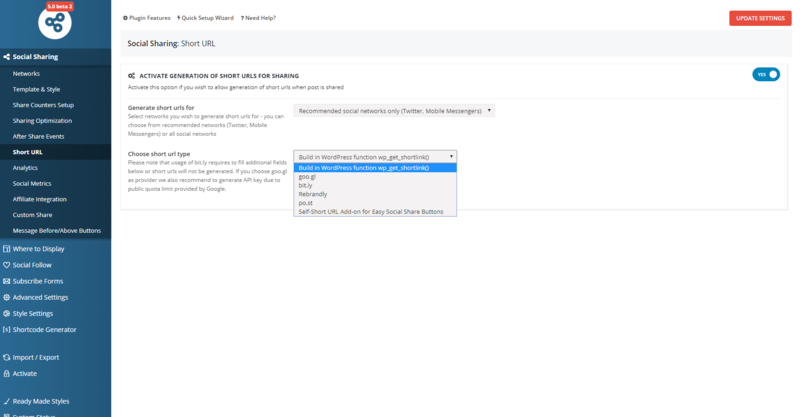 Advanced Custom Share Options You can do even more with Advanced Custom Share Options – set a different address and message for each social network, and/or for each post/page. Translate on your language Easy Social Share Buttons for WordPress allows you to replace default messages with your own, from your plugin configuration settings. You are also able to add custom texts above Share and Like buttons. Plugin also has full multilangual support with WMPL and Polylang. Have a pre-sale question – check our support section in CodeCanyon. If you want to use the Easy Social Share Buttons for WordPress plugin in your ThemeForest theme as well, please purchase one extended license for each theme you put on the marketplace!